In 7th grade, students explore proportions and probability. They also learn to graph equations, which will prepare them for algebra in later years. You can help your child to better understand these concepts by creating word problems for him or her to complete at home. 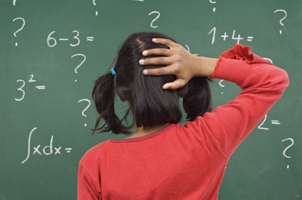 What Topics Should Be Covered in 7th Grade Word Problems? Word problems can be challenging for 7th graders because they have to sift through extraneous information to figure out what kind of expression to write. It's important that 7th graders become comfortable with word problems because they will appear in upper-level math classes, as well as on standardized college entrance exams. In addition to making sure your student completes all of his or her homework, you might encourage him or her to do extra practice problems daily. Your child's teacher is a good resource for additional problems; however, you may also want to create your own worksheets for your son or daughter to complete. If a problem proves troublesome, you can help explain the steps for solving it. A large portion of the 7th grade math curriculum is devoted to proportional relationships. Through word problems, you might show your student how he or she will use proportions in the real world, including calculating tips and discounts. Your 7th grader also will learn to graph expressions. When writing your own problems, you should include equations that follow the formula y = mx + b, where m represents the slope of a line and b is the y-intercept. 1. A car is traveling 75 miles an hour. How far will it travel in eight hours? The car's mileage per hour can be written as the ratio 75/1. The ratio for the variable (the distance traveled in eight hours) is x/8. Your child should establish a proportional relationship by comparing the two ratios in an expression: 75/1 = x/8. Then, he or she should solve for x by cross-multiplying: x = 75 x 8, or 600 miles. 2. If two shirts cost $31.50, how much would nine shirts cost? The proportional relationship for this problem is 2/31.50 = 9/x. After cross-multiplying, the expression should look like this: 283.50 = 2x. Your child should then solve for x by dividing both sides by 2, so that x = $141.75. 3. Graph the equation y = 4x - 2. Where does the line cross the y-axis? When graphing the equation, the slope is four and the y-intercept is (0, -2). 4. What is the likelihood that a die will land on two? There are six numbered sides on a die, so there's a one in six (1/6) chance that the die will land on two. Math word problems can be confusing, but there are ways you can help your sixth grader understand them. Read on to learn more about how to best solve math word problems. Is the Pledge of Allegiance Truly Voluntary?